This exhibition provides an overview of influential American artist Jacob Lawrence (1917-2000). Lawrence was primarily concerned with the narration of African American experiences and histories. His acute observations of community life, work, struggle and emancipation during his lifetime were rendered alongside vividly imagined chronicles of the past. The past and present in his work are intrinsically linked, providing insight into the social, economic and political realities that continue to impact and shape contemporary society today. Featuring more than 90 works produced between 1963 and 2000, the exhibition focuses on his graphic work and explores three major themes of his printmaking oeuvre. Lawrence’s recording and recollection of African-American and larger African diasporic histories are featured, as well as his vivid observations of dynamic city life in Harlem, New York City. Works in the exhibition include significant complete print portfolios, such as the “Toussaint L’Ouverture” series, as well as “The Legend of John Brown” series, amongst others. Enjoy a family-friendly tour of the exhibition. Then, learn the tools of printmaking and make a print with bold colors that tells a story. 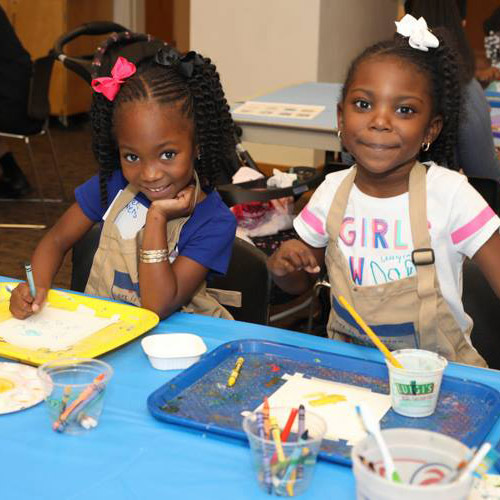 This program is ideal for families with children ages 5 - 11, but all ages are welcome. 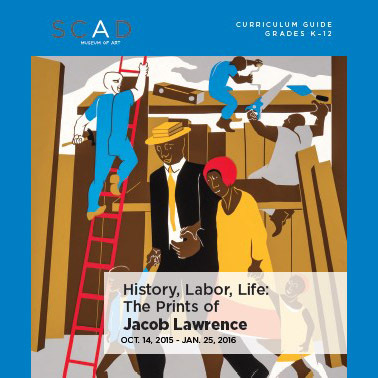 This guide provides learning exercises to explore the life and work of Jacob Lawrence, whose artistic dedication to the themes of social and historical consciousness, community and aspiration have a special resonance for educators and students alike. Lawrence’s prints provide the basis for activities that encourage students to examine, evaluate and create art, while providing cross-disciplinary links to mathematics, language arts and history. To find additional educator resource guides created related to other Harn Museum collections and exhibitions, visit our K-12 Educator’s Page.